This is Part II of my trip report; Part I covering Dublin is here. I arrived in London in Euston station kind of late on Wednesday July 8th. My friend Mary Sue went to school in London, and she had recommended very inexpensive lodging there, in a London School of Economics dorm called Passfield Hall, which fortuitously, was just steps from Euston. I got checked in, and headed back to Euston for a glass of wine and some internet (the dorms don't allow you to use their network, my only complaint about the place). I had forgotten that last call in London is at 11pm! I actually always liked that, because you could go out on a work night and still get home at a reasonable hour. The next morning, I met up with my friend Richard Wiseman (who I've written about here before), a very cool guy awarded Britain's "first Professorship in the Public Understanding of Psychology". Richard was in the midst of a media tour for his new book, 59 seconds, and suggested we meet at the Wellcome Collection. We had a very nice and wide ranging chat for a few hours, and then Richard showed me around the very cool (and quirky) collection a bit. Afterwards, I met up with Mary Sue, who coincidentally happened to be in London, and her friend Julien. We had a nice walk around the city (again, I had a free tour guide!) and a nice lunch at a pub, and then they delivered me to my next meeting with Sarah Angliss. Sarah is a musician, engineer, and sound artist, and is one of Richard's oldest friends. Years ago, Richard suggested that Sarah and I should meet if I ever got to England (the original plan was for the three of us to have tea, but Richard's media schedule changed). And Richard was definitely right, Sarah and I had a great talk for a few hours about all kinds of things (including some of her work that I will be writing up here soon), before heading off to the West End to see Derren Brown's show, Enigma (separate write up on that show to come). On the way, Sarah took me by "The Forth Plinth" by sculptor Antony Gormley in Trafalgar square. The fourth plinth is usually "reserved for statues of Kings and Generals", but with this piece, Gormley is having regular people stand there for an hour each. It's an interesting concept, but a bit uneven. After the show, Sarah and I stopped by a pub to talk about what we had seen (and do a bit of speculating on how it was done). The next morning, I met up with Mary Sue, and toured her friend's amazing house in Soho, and then we embarked on our own walking tour of the city. We covered most of the major tourist areas, of course, although many of them had changed since I was there in the 80's. Tiring of the tourist throng, we headed up to Camden, where we had a nice time wandering around. I remembered this area from the eighties when I bought bootleg cassettes (!) there, and it's still a fun area. 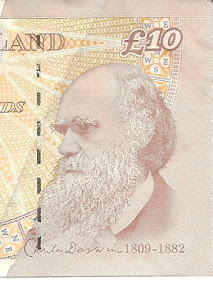 They even have Darwin on their 10 pound note! And I saw this in the windows of a production company in Soho called Evolutions. Afterwards, we had a nice Indian dinner at a restaurant that Mary Sue had remembered from her school days, and afterwards, we spotted a bunch of these things for sale on the street, and I have no idea what they are! The guy selling them couldn't even explain it. Maybe it's evolution? The next morning, I headed back to Euston station took the tube to Waterloo station, where I caught the train to Bournemouth, where I visited my friend Philip. I got there in the afternoon, and we headed out for a bit of kayaking during the rainiest day they had in weeks. It was fun, though, although Philip's extra racing boat was a bit tippy for me, and I capsized (first time ever doing so unintentionally) and was so surprised I didn't even remember to try and roll up. We got dried out, and had a nice dinner and much discussion with Philip and his wife over a bottle of wine. I took the trains back across to Ennis, where I met the first night welcome dinner of our bike tour, which I will cover next, starting with Part III. More photos of this part of the trip here and here and here.